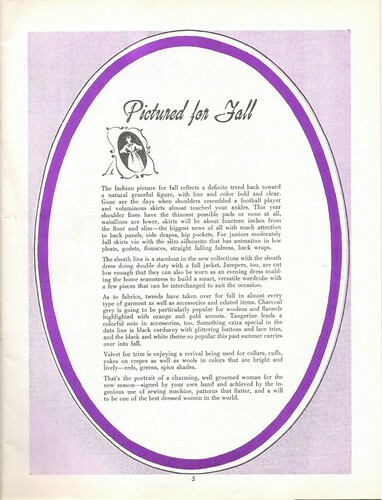 A recent search for vintage patterns on Etsy led me to this lovely pamphlet. I was unsure exactly what to expect from my purchase, but was extremely pleased when it arrived in my mailbox (isn’t it fun to find packages instead of boring junk and bills?). It turns out, it is a mail order pattern catalog, of sorts. But there is so much more! 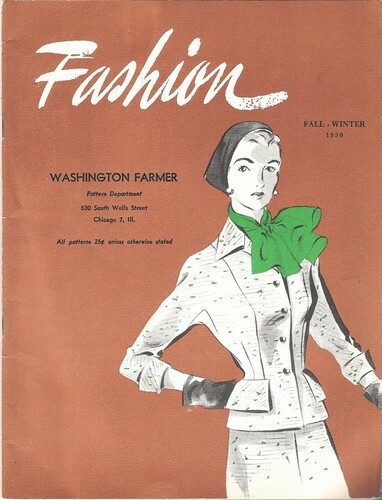 And who knew farmers were so chic! Does anyone know some fun facts about Sew-Rite Perforated Patterns? I generally think of mail order designs as pretty basic, but some of these are truly exquisite. What wouldn’t I do for this suit?!? And the hat, and the purse and gloves (that poor dead creature I can do without). I could keep the treasure to myself, but that just wouldn’t be fair. So I thought I would share bits and pieces throughout the next few weeks. “The fashion picture for fall reflects a definite trend back toward a natural graceful figure, with line and color bold and clear. Gone are the days when shoulders resembled a football player and voluminous skirts almost touched your ankles. 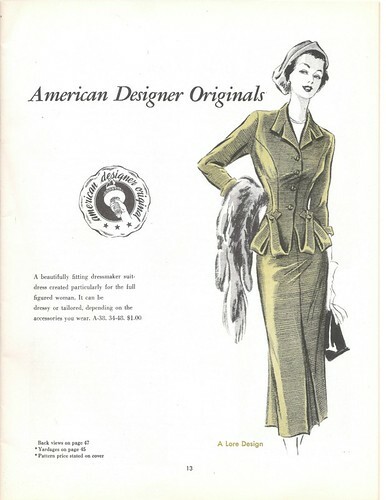 This year shoulder lines have the thinnest possible pads or none at all, waistlines are lower, skirts will be about fourteen inches from the floor and slim – the biggest news of all with much attention to back panels, side drapes, hip pockets. For juniors moderately full skirts vie with the slim silhouette that has animation in low pleats, godets, flounces, straight falling fullness, back wraps. The sheath line is a standout in the new collections with the sheath dress doing double duty with a full jacket. Jumpers, too, are cut low enough that they can also be worn as an evening dress enabling the home seamstress to build a smart, versatile wardrobe with a few pieces that can be interchanged to suit the occasion. As to fabrics, tweeds have taken over for fall in almost every type of garment as well as accessories and related items. Charcoal grey is going to be particularly popular for woolens and flannels highlighted with orange and gold accents. Tangerine lends a colorful note in accessories, too. Something extra special in the date line is black corduroy with glittering buttons and lace trim, and the black and white theme so popular this past summer carries over into fall. Velvet for trim is enjoying a revival being used for collars, cuffs, yokes on crepes as well as wools in colors that are bright and lively – reds, greens, spice shades. So much of that sounds familiar . . . the more things change, the more they stay the same. Fall tweeds, flounces, and tangerine [tango], here we come! Great find! I look forward to seeing more from this pamphlet. I've got to come to the defense of mail order patterns here. I never used to pay much attention to them because I assumed they were the ugly stepsister of the pattern world, but there are some truly gorgeous ones! The major advantage of mail order patterns is that they are a lot easier to find in larger sizes. 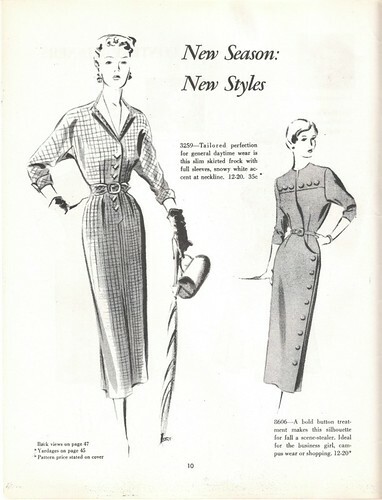 Good luck find a 40" bust from the 1940s from a major pattern company, but I come across them quite often in mail order patterns. We are just getting into summer here so no more plaids and tweed for me :( But I'm happy to get some of my beautiful florals out though! Wow, this is great - especially that second one! Such interesting detailing.